Another environmentally sound choice for flooring is bamboo. Bamboo is manufactured from processed strips of cane and compressed to be as hard and durable as a regular hardwood floor. Some bamboo is supplied in North America if the environmental impact of transportation is a concern. Bamboo floors that are less expensive may not have the highest quality UV protective finish as other floors. 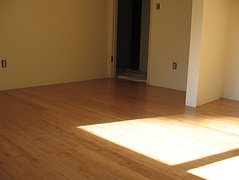 Radiant flooring can be used under bamboo flooring. Bamboo is technically a grass and not a hardwood tree. Don’t let this discourage you from purchasing because the manufacturing techniques make bamboo a strong, hard, durable and dimensionally stable surface. To give you an idea of the strength of bamboo, it has been rated to be almost as hard as red oak to slightly harder than red oak. The darker bamboo floors are reported to be softer than the lighter shades because of the heating process that darkens the color. The dimensional change with moisture content is also significantly less than that for most common hardwoods. Nearly all bamboo flooring sold in North America is produced in the southern Chinese province of Hunan, in an area known as “the bamboo sea” for its extensive bamboo forests. If possible to obtain the information, find out if the manufacturer of the bamboo flooring you are interested in allows the bamboo to reach full maturity. According to buildinggreen.com the shoots reach full size in one to two years, but it takes a third year for them to mature to the point where they are no longer feeding the plant. If the shoots are cut before that time, the plant suffers, while after the third year the shoot becomes “dead weight,” and the plant benefits from its removal. Contrary to the concerns of some, the harvesting in these forests is not a threat to Pandas, as they live at much higher elevations and eat a different species of bamboo. There currently is no FSC certified bamboo so it is important to see what you can confirm about the bamboo you are interested in purchasing. Finish options include a Klumpp coating that comes with a longer warranty because of the quality of the ingredients. Klumpp coatings wear extremely well and are certified to be free from toxic substances. 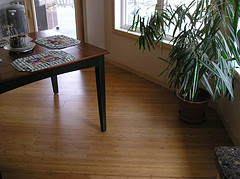 Bamboo floors are available with the following installation techniques: glue, nail, staple or floating in pre-finished or unfinished. 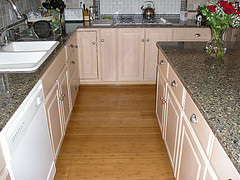 The installation process is the same as the process to install hardwood flooring. Bamboo is offered in planks, tiles as well as handscraped. The handscraped products have limited availability. The grain of bamboo is either horizontal or vertical. Vertical graining is a thinner, more linear look while horizontal graining is wider showing the knuckles of the bamboo. With horizontal, the pieces are arranged and laminated side by side flatways. With the vertical type the slats are stood upright on edge and then laminated. The first colors that were introduced were carbonized and non-carbonized. The result were a natural, amber, brownish color as well as a yellow based color. The brownish amber color is achieved by pressure steaming the bamboo, which creates a darker color through carbonization. More recently, colors ranging from rich reds to mochas and blacks are available. Like hardwood flooring, bamboo floors need to be swept or vacuumed (without a beater bar) regularly to keep dust and dirt away. Dust and dirt can scratch the finish of the floor. Mats should be placed at every entrance to keep the dirt from entering your home. Spills should be cleaned up immediately. Spills that sit too long can penetrate the floor and permanently stain the floor. To avoid invalidating your warranty, be sure to check to see if a specific cleaner needs to be used. These cleaners can be recommended from the manufacturer. Rugs that are non rubber backed should be used to avoid discolorations on the floor. Chair and furniture protectors should be used to protect the floors. Fabric or felt types are recommended. Casters should be removed and replaced with felt floor protectors when possible. Because sunlight can fade bamboo floors, furniture and rugs should be rotated periodically. Rotating the furniture and rugs will produce a more even color. Use of window coverings also helps protect floors from sunlight. High heeled shoes can permanently damage bamboo with dents. Like the damage high heels can do, dragging heavy furniture or other items can permanently damage bamboo floors.